The Hobbit is one of those books I have always intended to read. As a kid, I was deeply disturbed by watching part of the Rankin-Bass movie, and that put me off the entire thing basically until the Lord of the Rings movies came out. Then I was suddenly all about Frodo, and I got very into the whole Tolkien universe. But I still didn’t read The Hobbit. Now, once again, I’m ashamed to say that I’m being motivated to read a book because its movie is coming out. I hope that it saves some face to say that the copy I read was the authorized paperback edition from 1965 and not a 2012 edition with the movie cover, but I’m still pretty ashamed that it took me this long to read a classic. The Hobbit follows the adventures of reluctant traveler Bilbo Baggins, who is selected by Gandalf to accompany an expedition of dwarves who plan to fight a dragon and win back the treasure they lost years and years ago. As compared with Lord of the Rings, this book is much less dark and less violent. Bilbo does find himself in dangerous situations fairly often, but even when others around him perish or are injured, he is spared the majority of the pain and suffering. I imagine this is because The Hobbit is intended as a children’s story, and that Tolkien wanted to incorporate excitement and adventure, but without scaring his audience so much they’d want to stop reading. I enjoy Tolkien’s writing, and even read sections of this book aloud to myself in my empty house to just really appreciate the words and descriptions that he puts together. I was disappointed, though, that this book lacked a lot of the high stakes and subtlety of the Lord of the Rings trilogy. I had gotten the impression somehow that there were more obvious connections between the two stories than I actually found. 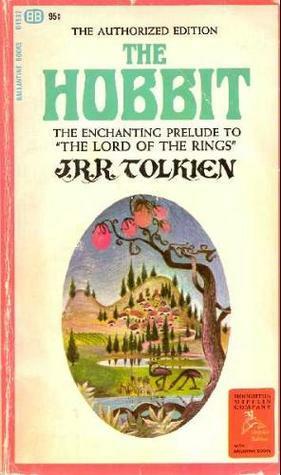 It was fun to read about Bilbo’s first encounter with Gollum, wherein he comes to possess the ring that causes all that trouble later on, but I had always imagined that Gollum had a huge role in The Hobbit, and in reality he gets just one chapter. I was thankful for the other characters I got to meet, however, especially Beorn, the large man who can morph into a bear. (He reminded me somewhat of Tom Bombadil, one of my favorite LOTR characters, and I can only hope that they won’t cut Beorn from the film the way they did Tom.) I also have the same affection for Gandalf that I do for Albus Dumbledore. I sighed in relief each time he reappeared in the story, and his relationship with Bilbo is very touching, especially knowing what it will be like in the future stories. I’m not a fantasy reader, I always say, but The Hobbit is one of those books that everyone should read, regardless of the genre you feel most comfortable with. It’s a bit dense for inexperienced readers to enjoy alone, but it would be a perfect family read-aloud. Kids like stories about defeating dragons, and Bilbo is child-like enough that kids can imagine themselves in his shoes and follow him on his journey. The nice thing about fantasy titles, too, is that they don’t get dated as quickly as realistic fiction titles. The world Tolkien has created can always exist in our imaginations, without the worry that some modern technology will change the way we think of it. Anyone taking a child to see the first The Hobbit film this holiday season should definitely share the book with that child first. Kids who love Ranger’s Apprentice, Harry Potter, Last Apprentice, and Septimus Heap will feel right at home in Bilbo’s world, but many other types of readers can find something to love about it as well.